I have a confession to make – I’ve watched them darn Pixels. Despite the neat neon arcade visuals in a couple of battle scenes, Adam Sandler brand is toasted and I’ve long forgotten why I ever watched anything but The Wedding Singer and 50 First Dates with him, may his fans forgive me. However, I’ve survived to tell the story of how incomparably better an investment is Bandai Namco’s Pac-Man Championship Edition DX than the sad summer movie that had me rolling my eyes 90% of the time and laughing only once when Sean Bean hugged Brian Cox. Even the mega-star Peter Dinklage couldn’t rescue the pixel flop. Oh well, we have better things to discuss, so if you are on the fence about the $5 purchase, read the review below for more insight. I can see what the developer is doing here. It’s not just an appeal to the nostalgia of those old enough to remember the original game. Pixels the movie is the perfect pitch for the game meant for those who are too young to care about the games of the past. Whereas the movie might draw attention of the younger audience due to some bright visuals (that are way too rare, unfortunately), it is the game that will capitalize on the media buzz around the movie, and Pac-Man will hopefully see an influx of the fresh, young adepts. The game has been in the soft-launch for over a year as a freemium title, but now that it’s officially launched on the major mobile platforms, Bandai Namco has decided to make its long-time fans a favor by making it a premium, no-IAPs title. Arigatō! Gone are the wait timers, IAPs and all that freemium attire, and provided the game offers an immense amount of content – 132 levels with 3 game modes each – and a dangerously high addiction rate, you are safe with this purchase. 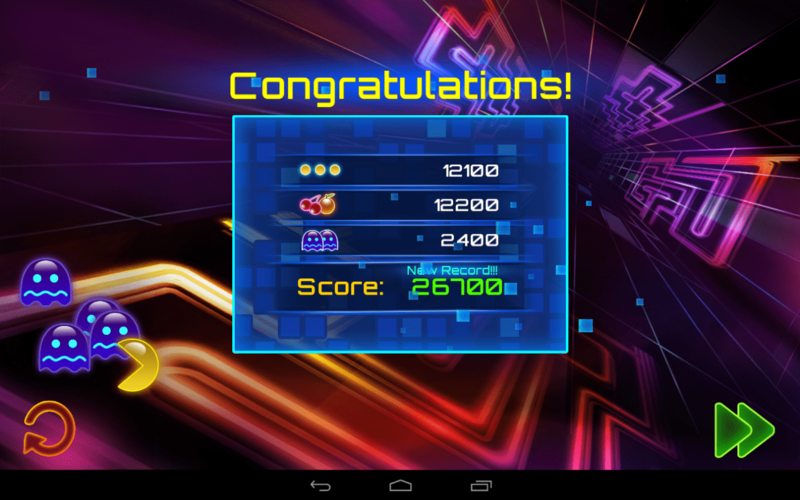 Pac-Man CE DX is focused on time-based and high-score challenges, taking the best of the classic wisely enough not to break it, and spicing the game with quite a few novel moves and a ton of glamorous paint. You control the titular Pac-Man, but there is no way I can convince my nephews its name is not Pixel. 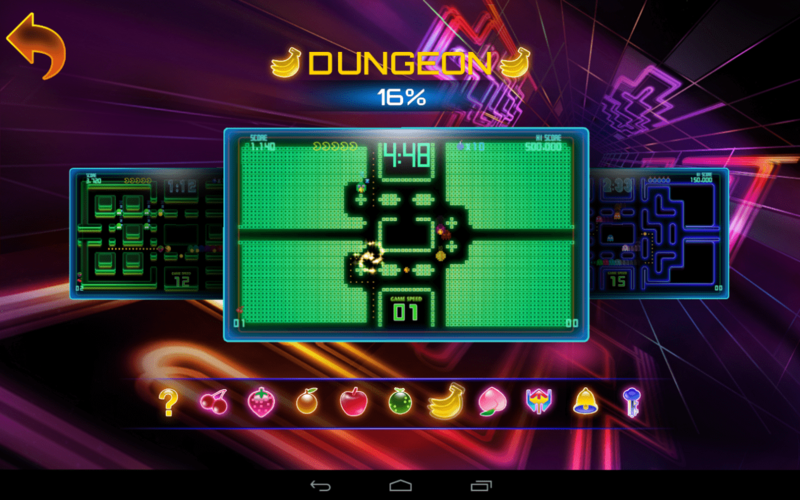 The game puts you in a maze with ghosts, yellow dots, fruit and power pellets. The location of all the items is ever-changing, and the maze’s exits are directly connected to its entrances, and work both ways. You have to collect the yellow dots to earn points, and once you clear one side of dots, a fruit will pop up on the other – collect that for higher score. Once you pass close by a sleeping ghost, and they are all sleeping by default, they wake up, get angry and start following you, the Pac-Man. Their speed is identical to yours, so if you make the turns at the right time and don’t lose milliseconds in returning to the missed turn, they should not catch you. 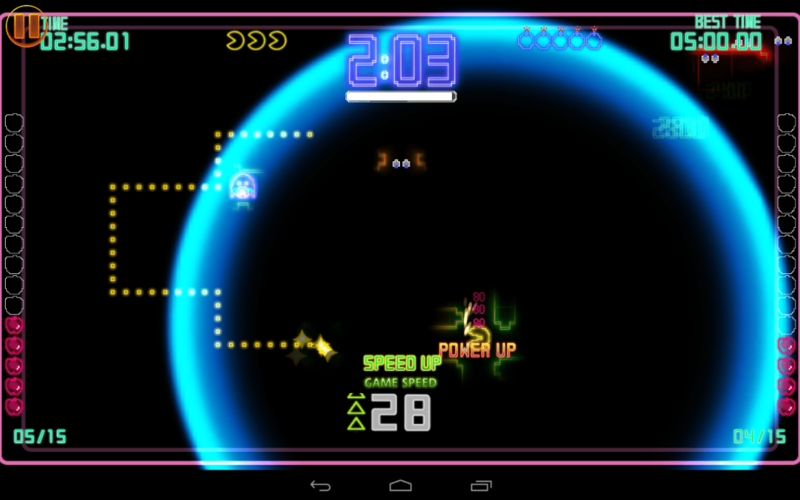 The power pellet is a big yellow dot and once you grab it all the ghosts turn blue and you can eat them. And eat them you should because it multiplies your score greatly. Some ghosts carry the power pellets, but don’t attempt to eat them while they’re active – you’ll lose a life. Then there are bombs. If you don’t know how to use them, head to the How To Play section and swipe to the fourth, or fifth slide – Bombs. You need to “pinch out” to activate a bomb when the ghosts close in on you and you have no power pellet. One of the few complaints I have about this acid game is the said “pinch-out” gesture, which does not always work when I do the pinch-out. Nonetheless, with the controllers it’s much easier, and the game supports a slew of those. The ghosts make chains – when one awakes and starts following Pac-Man, and the latter passes by another ghost, the second ghost joins the first one in a chain, and so on. 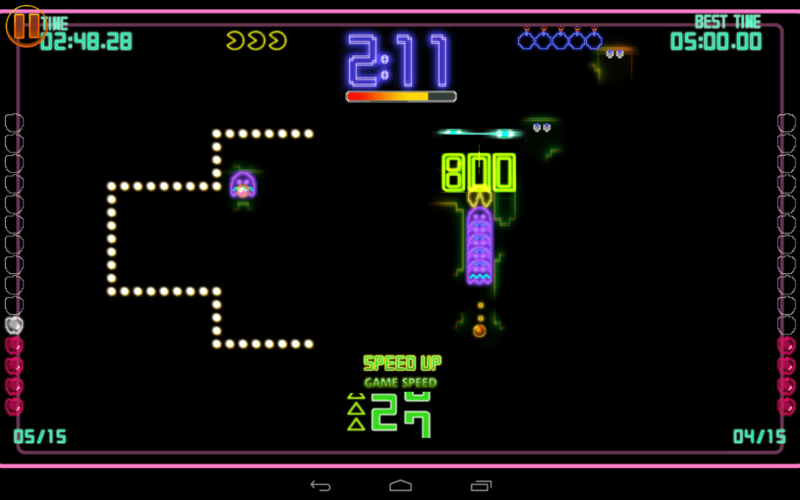 One of the challenges in all the levels is to eat X number of ghosts consecutively. I said the game supports external controllers, and plays quite smooth with them. However, the swipe scheme also works pretty well for this game, and you can swipe the direction you want to turn before Pac-Man reaches the turning point – to avoid control errors. 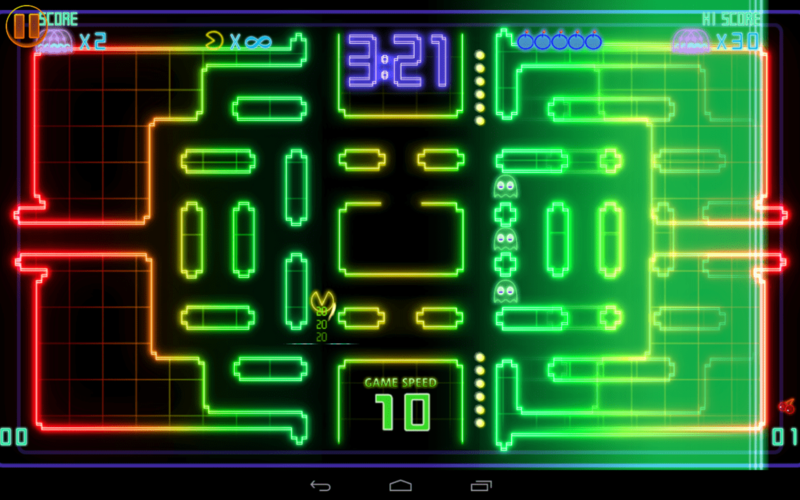 It works great and when you make the swipe you can see an indicator that your gesture was registered and Pac-Man will make the corresponding turn when the maze allows it. 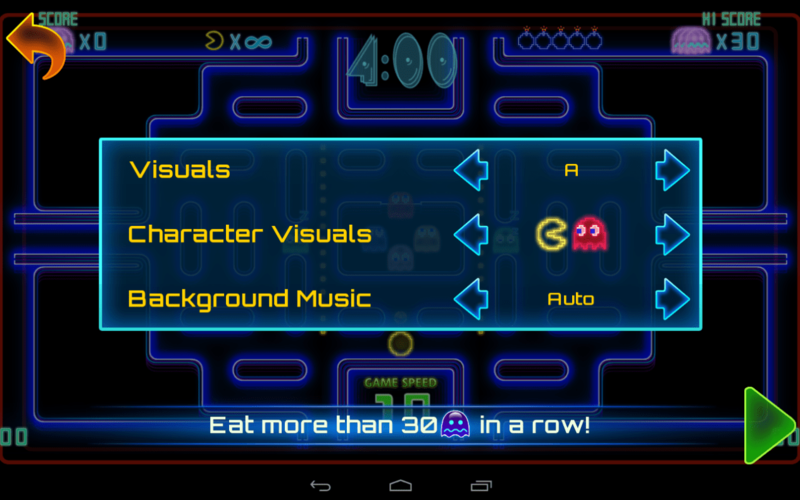 The indicator is a subtle wind-like animation near Pac-Man. 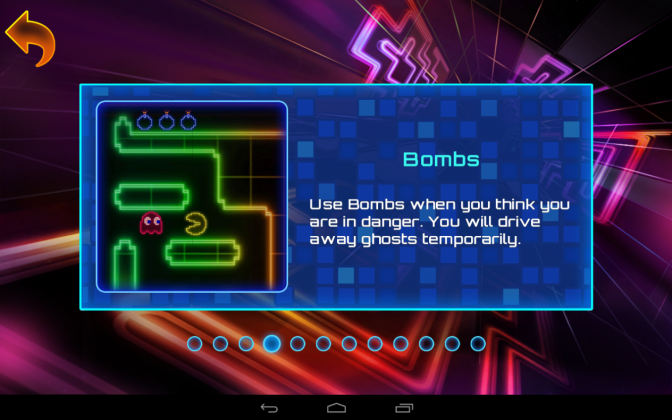 The bombs activation requires you to pinch-out, which does not always register, however. There needs to be a simple touch button to use a bomb. Overall, the controls are fine and responsive. 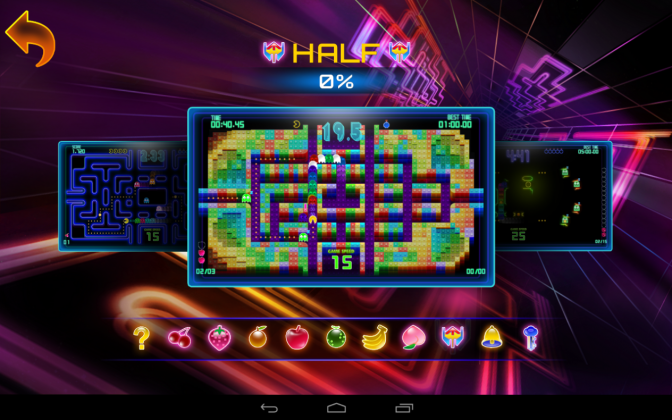 You’d want nothing less than an excellent replayability for your $5, and Pac-Man CE DX has it. There are 10 zones with unique layouts, which is just the right amount that lets you learn your maze by heart, and by the time you are ready to go with the Darkness, you pretty much know what to expect. Championship II, Highway, Junction, Spiral, Manhattan, Dungeon, Championship I, Half, Darkness and Free all have three game modes – Score Attack, Time Trial, Ghost Combo and some additional, unique per each zone. 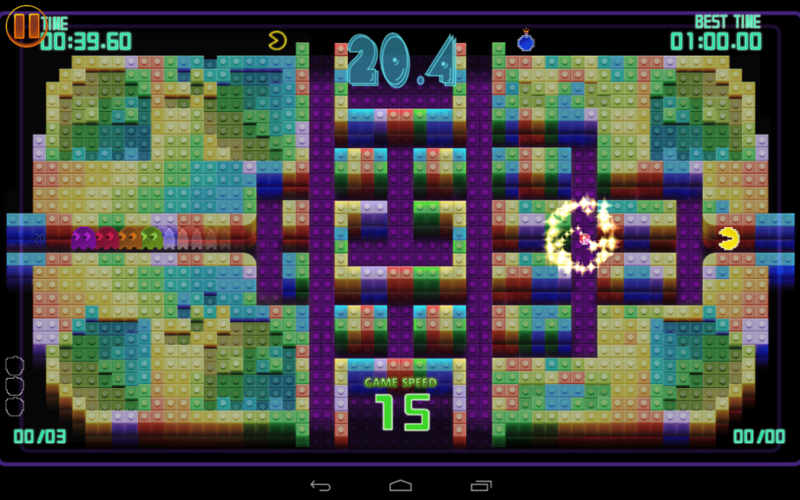 For example, Championship I is the maze from the original game but with DC rules, which creates a fun mix of old and new elements. The Darkness obscures the maze, and Pac-Man moves about illuminating the nearby blocks with his body as if it were a torchlight. 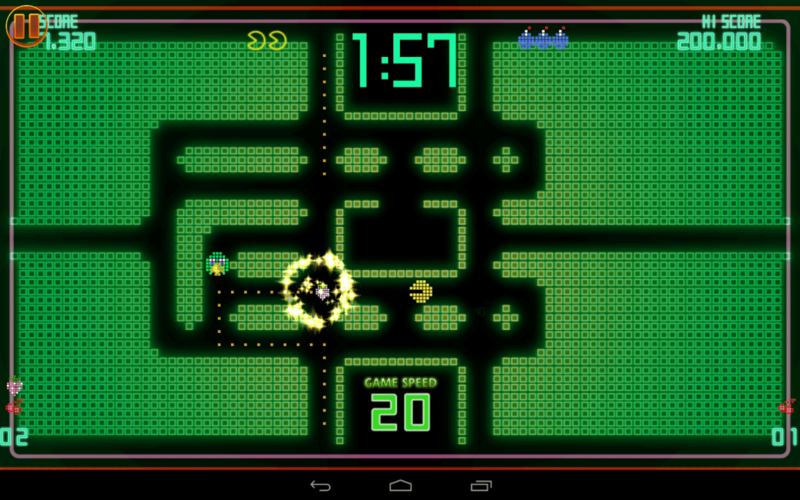 The only things you can see on the grid is the ghosts and the yellow dots and power pellets. 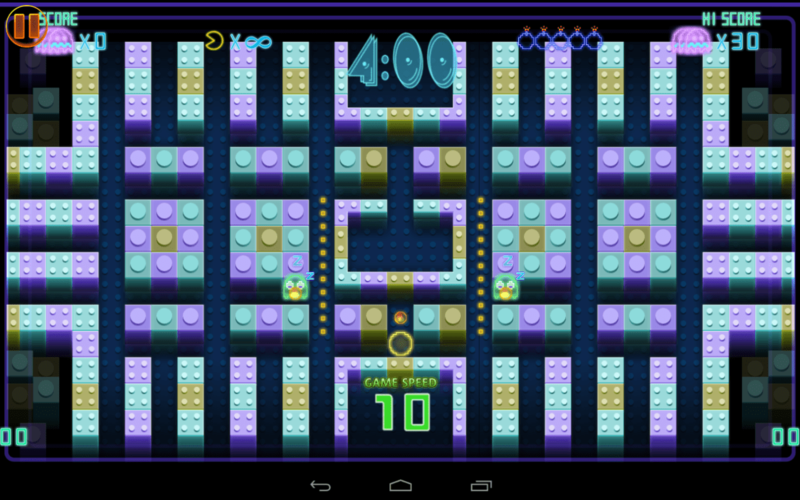 The game is long known to induce high levels of addiction in players, so this time is no different. 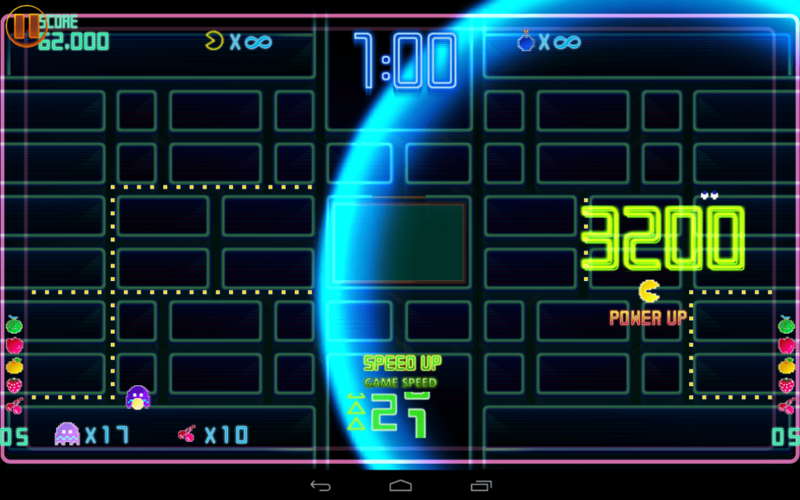 Its one-minute and five-minute time trials are perfect for short gameplay sessions on the go, and yes, you can play without an Internet connection, unless you want to see where you are on the leaderboards. I do have a suspicion they are not updated in real time, though. The total of 132 levels is also varied due to the different difficulty settings you can choose per each level – beginner, normal and extreme, the latter offering only one life and quite a pace. The game starts at a pretty slow pace, but as you collect the goodies it accelerates, and the difficulty settings make the game accessible to the beginners, too. For example, if a ghost approaches too near, the time slows down and you have an advantage to turn another direction to avoid collision. Then, you have three lives and 10 bombs, so I’d say it’s quite forgiving when on Beginner and Normal settings. The fact that the ghosts are sleeping by default and get activated when you pass nearby lets you create long chains of them, then get lucky to gobble a power pellet and turn them all blue to eat a bunch of them. This is a very rewarding mechanics and the hit points for eating 7 ghosts consecutively are quite generous. 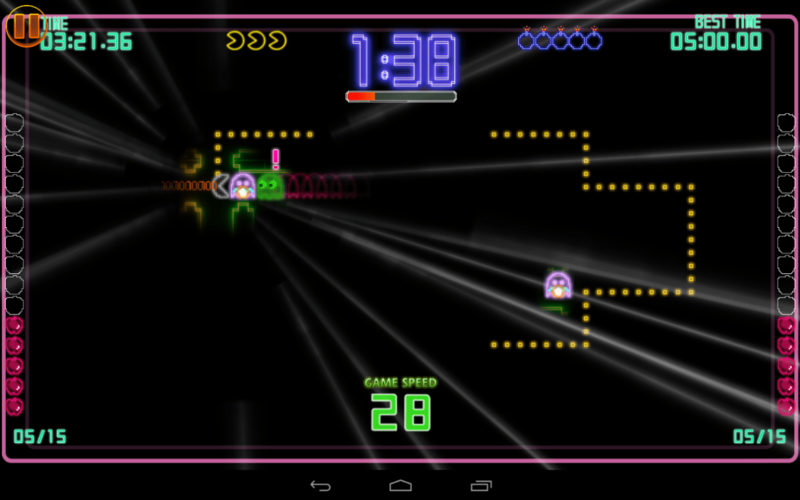 In terms of speed, the mobile port offers a comfortably increasing speed, unlike the ludicrous one on consoles and PCs. The score attack mode, however, is the toughest and shows the virtues of the game best of all, in my humble opinion. Since we are talking about the settings, you can customize a variety of things before each play – the design of the maze (some have three designs, some five and correspond to letters A to E), the design of the characters and the soundtrack, or no music at all. The game’s settings also let you mute the sounds and/or the music. The settings have one little nag, though. You have to adjust them before each and every level. That is, if you want your game Extreme, you have to specify that every time. Also, there is no way to adjust the volume of music and sounds from the app – you either turn them off completely, or adjust the games’ volumes from your device’s settings. I cannot express what an acid neon delight this game is, with dome of the levels being totally Tron, others fiendishly Lego, others wonderfully 80’s and some quite new-age. Besides, you can choose from a variety of skins per each level, as well as the characters’ designs. 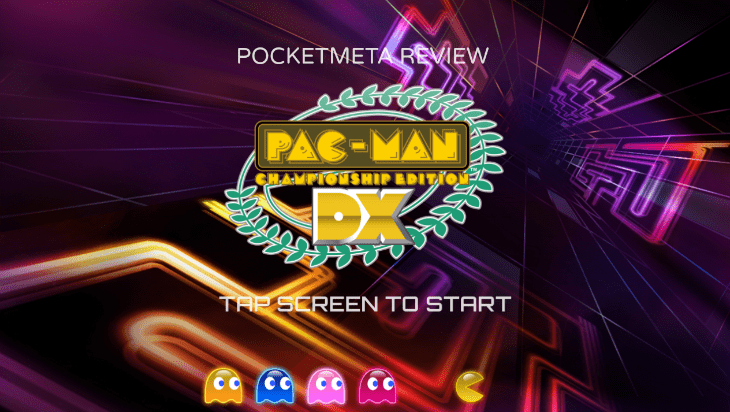 In every aspect of its artwork and music, Pac-Man CE DX is a masterpiece, the mobile arcade gaming at its best. The electronic soundtrack list is perfectly fitting with the gameplay and I am enjoying it just as much as I do the chic visuals. 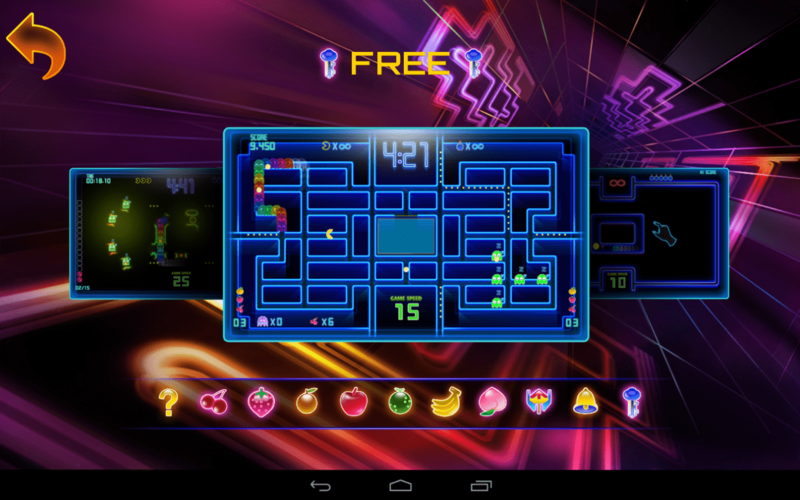 Pac-Man CE DX is without a doubt a masterpiece and a great step up from the classic game, evolved and worth a purchase. Nothing that worked was broken, and the novelties add quite a variety to the gameplay. The design is dazzling, the music is acid electronic and the gameplay is intensely addicting and rewarding, with the adjustable difficulty and level design, bombs and power pellets that let you gobble up all the ghosts in the maze. The controls are smooth, if not for a small bombs lag, and the cloud save with leaderboards and a ton of levels make it an instant buy. 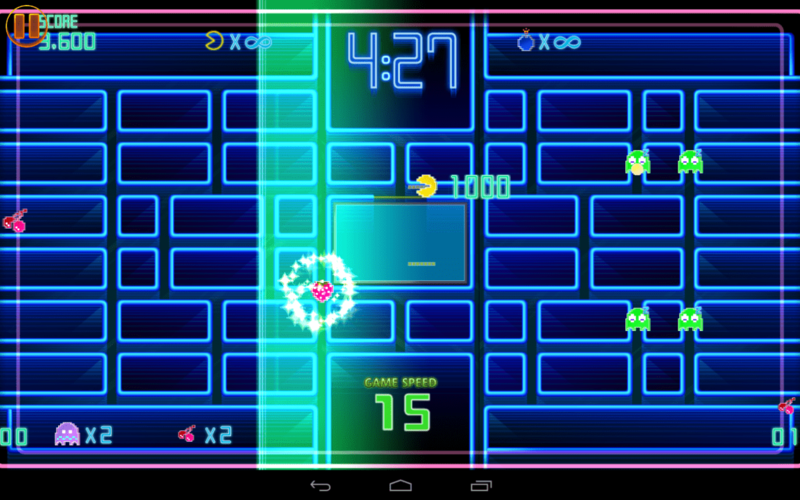 If you’ve played Pac-Man before, you will most likely love this one, and if you are a newcomer to the franchise, get it anyway – it’s cheaper than the movie ticket and offers a lot more entertainment and replayability. P.S. Pixels was a great idea for a movie. Nothing like a fine Pac-Man game can cheer you up after a disappointing Pixels movie, and Pac-Man CE DX is without a doubt a masterpiece.